Here at Renaissance Bathrooms, we always have great value ex-display products to offer – Check back regularly to secure your dream bathroom! We pride ourselves on supplying top quality bathrooms at incredible prices, view our special offers page for unbeatable offers. We are a real company with over 30 years of experience and expertise and have 2 bathroom showrooms within the Thames Valley. Long gone are the days of the old fashioned basin and dreaded high level loo! Here at Renaissance we embrace some of the finest designs. At Renaissance Bathrooms we take your bath choice very seriously. Whether you are looking for a functional bath or one of sheer opulence. A well designed shower room in your home will add both value and desirability. It’s amazing how very little space can accommodate a full or part shower room. Quality furniture is an absolute must for the modern bathroom. 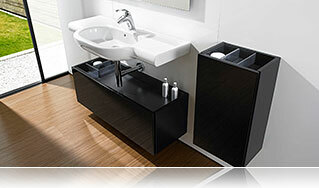 Choose from simple under basin drawer units, beautiful wall cabinets or complete fitted furniture. Wellness products including sauna and steam are a way of life. Stress-busting and deep cleansing that only a true steam shower or sauna can provide. Tiles come in all shapes and sizes, materials include ceramic, porcelain, glass, metal, marble and granite. Tile buying made easy at Renaissance. Your luxurious new bathroom should NEVER be cold, and we will of course advise you accordingly. Bring us your room details and we will calculate the heat requirement for the room. Water is vital to all living beings, without it we simply wouldn’t exist. We take our water for granted as we are lucky in the UK to have this essential chemical on tap. This represents a massive saving of £1,060.04 on the recommended retail total of £2,930 for this shopping basket. Call us now on 01753 530676 to find out how much you could save on your next bathroom! Renaissance Bathrooms to the rescue! Thanks so much for getting our bathroom so quickly, we were being quoted 2-4 weeks from other showrooms and you managed a next day delivery in full. Amazing! Best Bathroom Showroom By Far – My wife and I were so pleased to find your bathroom showroom, we travelled from Basingstoke and it was so worthwhile. Real world experience, expertise and advice for bathrooms. This represents a massive saving of £2,280.32 on the recommended retail total of £6,464.99 for this shopping basket. This represents a massive saving of £8,954.94 on the recommended retail total of £23,385.01 for this shopping basket. Need Advice or A Free Quote?